According to Merriam-Webster dictionary a routine is a habitual mechanical performance of an established procedure. Snoooozzzzeefest, right? Maybe, but bear with me while we talk about why you need this in your life, and when it’s good to shake things up in your routines. Why Do You Need Routines? Routines are essentially a string of habits that you intentionally bring into your life. They provide structure and many good habits strung together leads to less stress and over time, transformational change. If you have ever found yourself saying, “I wish I …." at some point during the day the a routine can help you. "I wish I..."
Had time to think about how to strategically build my business versus constant fire fighting. Could find my keys in the morning. Could drink my coffee when it was actually hot. In real life we often stay at "I wish" versus moving to "I will" because life gets in the way. I can’t find my shoes, I’m too tired, I ran out of time, it seems so overwhelming, etc… Having a routine in place moves you from wishing to doing. A good routine Reduces Stress and Procrastination by Reducing the Need to Plan. I believe that when you wake up you have a certain amount of mental energy to get you through the day, and accomplish what you want to accomplish. There is a ton of stuff that we son't need to waste brain power on, so automate it. For example, how many times you find yourself in front of your fridge with the door hanging open staring into it hoping that dinner, any dinner, will magically appear? 5, 10, 15 minutes pass before you realize this is not George Jetson’s house, and you will have to make something. That's stressful. It's a minor stress, but at the end of the day it's something I would rather not think about , and it takes time. Time I don't want to give. Let’s say, that in reality it’s only 2 minutes of staring. That is 735 minutes a year or 12 hours a year staring off into space. That's a lot of time. If you have a routine of planning your menu for the week, you no longer have to worry about what’s for dinner 7 days a week. You have to worry about it just one time a week. Or, you can simplify your menu, and every night, protein, veggies, starch (or whatever) or Meatless Mondays, Tuesday Tacos, Pasta on Sunday, etc. Be creative and automate to your level of comfort. Build good habits almost painlessly (with just a little willpower) and Build Momentum to keep making positive changes. Remember a routine is just a series of habits, and you can start with just one habit. Also, It is easier to start a good habit and let that new good habit eradicate the bad habit, versus just trying to stop a bad habit. Plus, when you have the time plan you will generally do what is in your best interest. A routine gives you time to plan. Once you prove to yourself that you can do it, you will be more confident about adding another habit to the first. So, start with putting your keys in a designated spot before you go to bed, then once you have that, start laying out your clothes the night before, etc. If you brush your teeth every night before you go to bed, then you have already proven that you can do this. Routinize a block of time to achieve your goals. You can also use a routine to make time for those special projects near and dear to your heart that you want to do, but never have time for. Run a mile Doesn’t sound like much? Well, that’s 365 miles in a year. Better your future: Want a new job, spend 15 minutes polishing your resume or cover letter, touching base with your LinkedIn contacts, making a lunch appointment with a mentor or setting up an informational interview with someone doing your dream job already. Learn or get better at something. Maybe you just want to get good at the piano or kickboxing. Pound the ivories or the punching bag for 15 minutes a day, and you are pretty much guaranteed to get better (or release a lot of frustration). For you pacifists, maybe it’s Yoga, or Drawing or painting. Keep things you don’t like to do from piling up. We all have those necessary, but not fun things that we need to do like email, bills, expense reports, housework, laundry, etc……. Pick a time once or twice a day and commit to spending limited but focused time making a dent in that chore. Good Habits and Routines often have nice side effects. Maybe you started packing your lunch that night before so that you made healthier choices, but if you do this 4 days a week for a year, assuming the average lunch is about $10, then you just saved $2,080 this year, and someone can now book a beach vacay or a trip to the spa. Routines can improve your mental health. Routines add habit and rhythm into your life, and like it or not your body thrives on rhythm. It likes knowing when it will get fed, and when it will sleep and wake up. Routines also keep you busy. Unstructured time can lead to boredom and isolation, which can lead back to unhealthy patterns and habits. This all sounds amazing, right? Well, what are the cons? 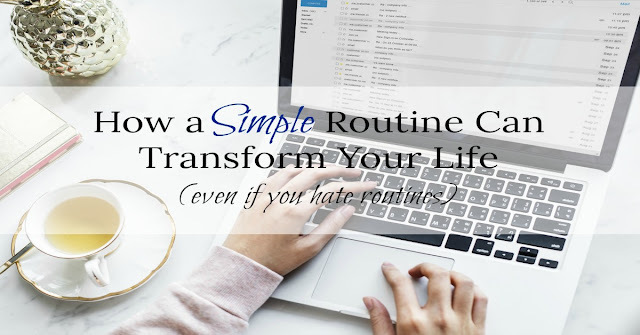 Routines are boring and stifling and I just can’t be tied down to that much commitment. Use a routine to get what you have to get done done, then block off time to do the things you love, spontaneously if that’s your thing. You can do the must do first, then let the rest of the day unfold however it may. It can stifle your creativity. Annie Murphy Paul wrote in article for Time that the typical morning routine (where you wake up late, grab a quick shower, your coffee and maybe a granola bar as you rush out the door) is a creativity crusher because studies show that you are most creative when you are slightly groggy and “naturally let your brain unwind itself”. I don’t know how your morning is, but I currently don’t have the luxury of letting my brain naturally unwind itself as I leisurely consider the many possible, wonderfully creative solutions to all my life and work problems while sipping my latte and listening to birds chirping. It sounds wonderful, right? Well, it ain’t going to happen unless you have a routine that creates the room to let it happen, Annie. This, my friends, is totally true. If you set up a routine that is impossible to meet or doesn’t allow any flexibility, then yes, you will undoubtedly fail to live up to your own standards and trying will cause loads of stress before you finally throw in the towel, and feel like a total loser. Periodically evaluate your routines. Is it still serving your best interests? Sometimes just change it up for the hell of it. Don’t pack your lunch this week. Instead go to lunch with a different person each day that you don’t normally eat with. This change up may lead to something you want to incorporate in your future routines or it may give you a renewed appreciation for the routine you have. Shake up your routine within your routine. Drive a different route to work one day (because your morning routine got you out the door with time to spare). Brush your teeth with your non dominate hand. What Does It Take to to Have A Successful Routine? It does take time to plan a routine and it does take willpower to stick to it until it becomes a habit. What if it doesn’t work, What if I cant’ change? That's why we start small and set yourself up for success not failure. In fact, stop calling it a failure. It’s an experiment. I am going to experiment with setting out my workout clothes the night before. I am going to experiment with giving myself 20 minutes during the day to work in peace on a special project or to do nothing. The possibilities for the small step is endless. Think about what might be preventing you from doing X, then start small, Get some success, then build on that success. Pick one thing that you would like to make a routine. Once that behavior becomes second nature consider adding or changing something else up. Stay flexible and accept some routines or habits just aren’t for you. So this week, as you go through your typical day, pay attention to when you say, I wish that I .… Then think about one small tweek you can make that will lessen your stress or get you one step closer to where you want to go? If any one gets stuck or needs some ideas on how to develop a routine, feel free to drop a comment here or on Facebook or send me an email (mommasandmimosas@gmail.com). Routines are my jam, and I love to brainstorm ideas. Next up: If you are feeling like you can’t get everything done, and you would like to be more productive, then the next blog post is for you. We will talk about Productivity enhancers including how to use routines to your productivity advantage.